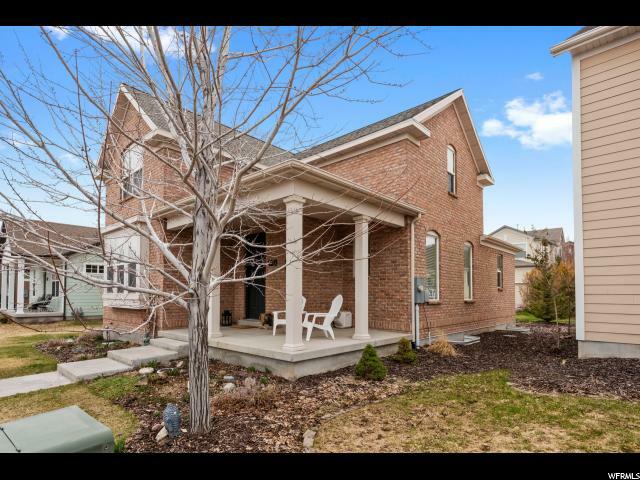 All DAYBREAK COMMUNITY A homes currently listed for sale in South Jordan as of 04/21/2019 are shown below. You can change the search criteria at any time by pressing the 'Change Search' button below. "Bright gorgeous Daybreak home. 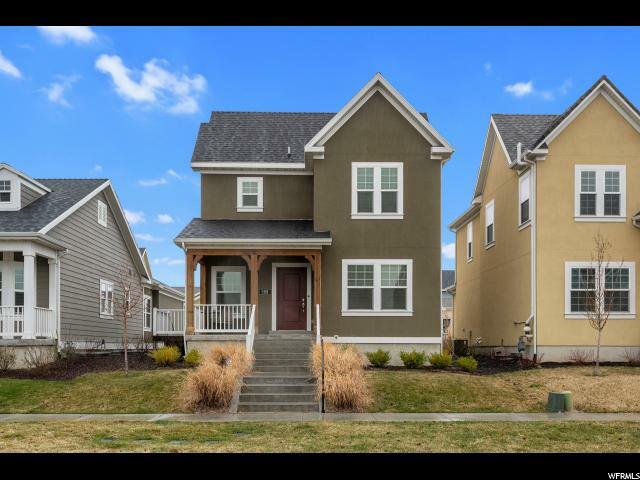 Newly built: wood floors, neutral colors, tasteful upgrades, premium water filtration throughout home! Vaulted ceilings, fireplace, FINISHED basement (unlike newly built models). We built this home for our family, but our job is moving us! Landscaping to be completed in 2 weeks (100% paid for). 3 blocks to lake, shops. HOA includes: internet, gym, paddle boarding, kayaking, fishing, bike/run trails, 5 pools/hot tubs, parks, sports courts, garden plots, dog park. Square footage figures are provided as a courtesy estimate only. Buyer is advised to obtain an independent measurement." "Beautifully updated home in Daybreak. Gorgeous modern finishes. Well cared for. New paint interior & exterior, new floors, landscaping, sprinkler system, newly finished basement. 3 car garage. Fenced back yard. Great location has wide green space, jogging trail, easy access without fighting Daybreak traffic, and plenty of guest parking. 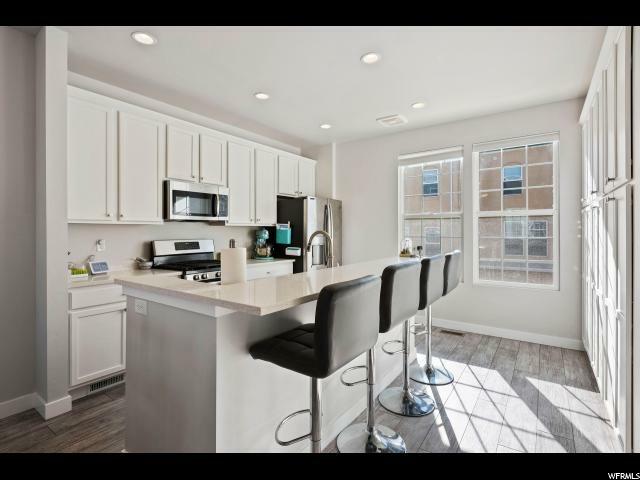 Upgraded 2-tone custom cabinets; granite counters and butcher block island; large family room; large vaulted master suite with 2 walk-in closets; jetted tub." "This modern home is perfect for the modern lifestyle. A main level office for someone who works from home. A quick walk to trax. A great living area for entertaining. Tankless water heater, solar, LED lights throughout. Plenty of natural light for energy efficiency. It even has a fenced in side yard for your special pet. Located by a grassy open space to play and hang with awesome neighbors. Finished garage, large finished basement. Each room has a large closet. Projector and screen included. Square footage figures are provided as a courtesy estimate only. Buyer is advised to obtain an independent measurement." "Every Upgrade Possible. Rare Large Lot. Brick Exterior. 25 foot vaulted ceilings. Massive loft. Coveted Colonial Model and floor plan. Cherry Wood Floors. Large windows. Oversized Kitchen: granite, crown molding, stainless steel, gas range, island. Giant master walk-in bath: garden tub, natural lighting, tile, granite, walk in closet. Two family rooms. Main floor laundry. Master bedroom with window seats. Quiet streets- not a drive-through street. Huge very well insulted and lighted basement. Square footage figures are provided as a courtesy estimate only. Buyer is advised to obtain an independent measurement." 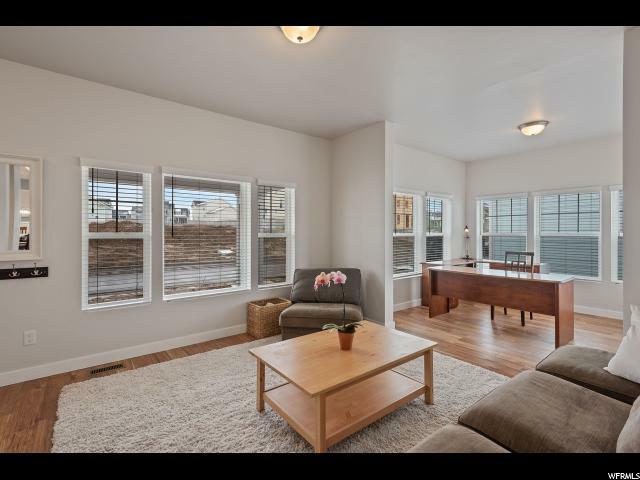 "Built in Dec 2017, this 3 bedroom, 2.5 bath, 2 car home is complete with rooftop deck for outdoor living and 360 Mountain views. This beautiful home is designed with large windows & open floorplan to take advantage of the natural light. Additional features: granite countertops, laminate wood flooring, high-volume ceilings, master suite with Euro-style shower & walk in closet, butler's pantry, island & stainless steel appliances. 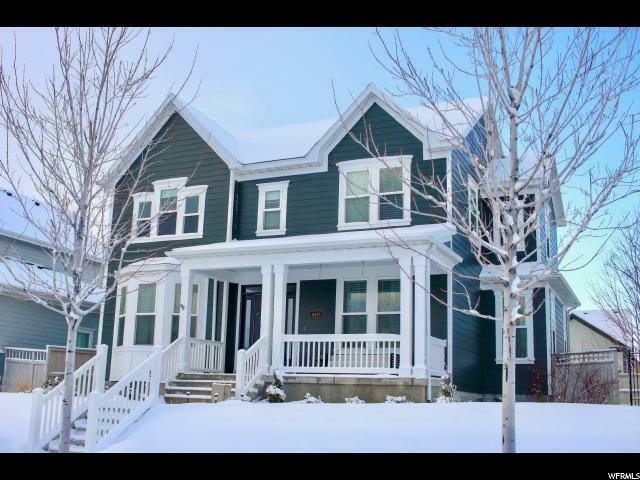 Located walking distance to Soda Row, Oquirrh Lake, & Trax station. Square footage figures are provided as a courtesy estimate only. Buyer is advised to obtain an independent measurement." "Daybreak open floor plan, barely lived in, off a quiet road, has the benefits of a HUGE yard with no maintenance. Kitchen w/ XL cabinets, stainless steel, dining opens to deck. Vaulted Master, walk-in closet, master bath w/ marble, separate shower/tub. Second floor laundry, washer/dryer included. Unfinished basement with completed plumbing. Creek nearby. HOA includes: internet, gym, paddle boarding, kayaking, fishing, trails, 5 pools, amazing parks, sports courts, garden plots, dog park. Square footage figures are provided as a courtesy estimate only. Buyer is advised to obtain an independent measurement." "Beautiful single family home in a highly sought after Daybreak community. Open floorplan featuring 9ft tall ceilings on the main level and separate laundry room. Fully finished three levels including a spacious 2 car garage and a customizable side yard. 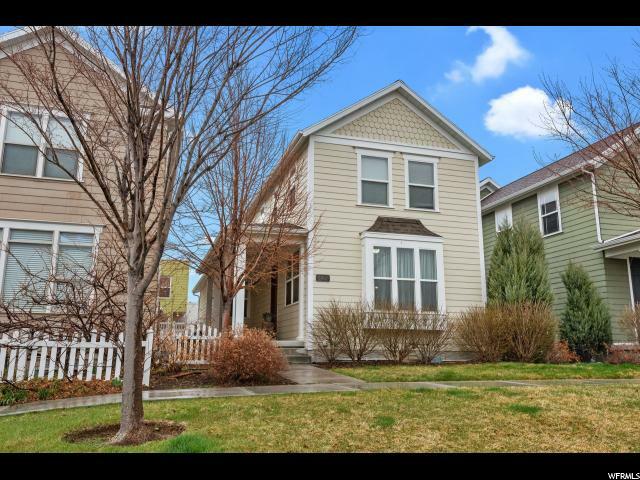 Easy commute from Mountain View Corridor, Bangerter Hwy or a short walk to TRAX. Includes all the Daybreak community amenities such as access to the lake, Community Center, 24 parks, gardens, 5 swimming pools, bike/jogging paths and much more. Square footage figures are provided as a courtesy estimate only. Buyer is advised to obtain an independent measurement." "Energy Star Certified! 2 master bedrooms with upgraded bathrooms. Vaulted ceilings, stainless steel appliances, gas range and quartz countertops in kitchen. Open floor plan with lots of natural light. 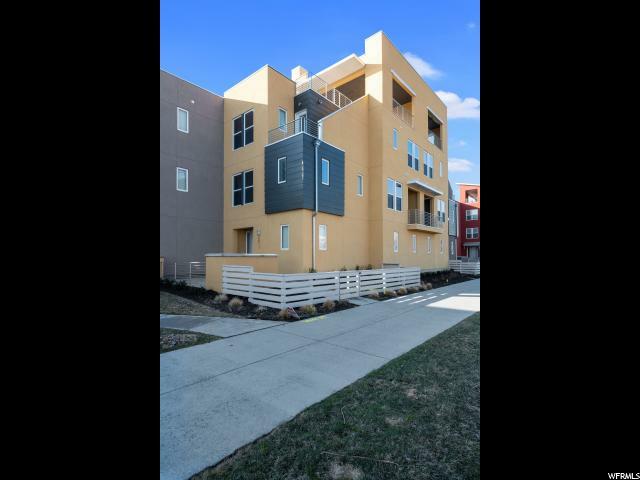 Walking distance to pools, parks, trax and the lake! Fenced in courtyard and large covered balcony. Third partially finished bedroom and unfinished 3/4 bath. HOA includes access to pools, gym, lake activities, splash pad, internet, snow removal, upkeep of exterior of home and so much more! Square footage figures are provided as a courtesy estimate only. Buyer is advised to obtain an independent measurement."